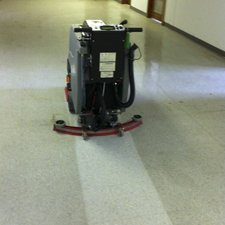 This Walk Behind MINIMAG Orbital Floor Stripper can easily cut through any floor finish you may have down for easy and quick refinishing. 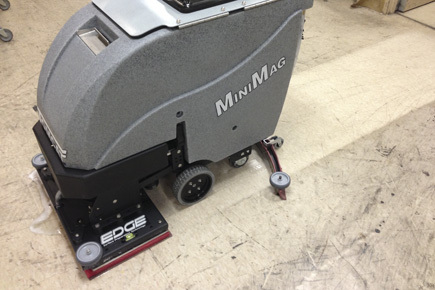 EDGE® Technology is meant for floor resurfacing and when paired up with our MINIMAG Walk Behind Orbital Scrubber it strips and cleans in one pass. 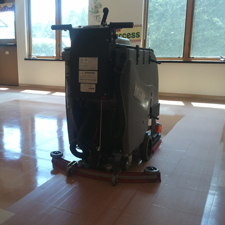 This Walk Behind MINIMAG Orbital Scrubber is stripping old finish off of a Grocery Store floor during business hours due to the machines cleanliness as well as low working decibel level. 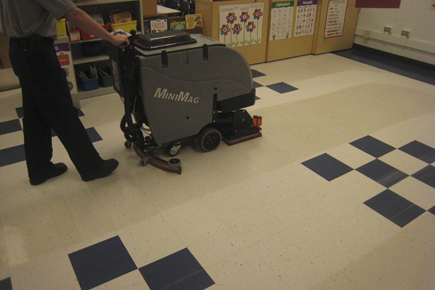 This Walk Behind Scrubber is the perfect size for small classrooms that need refinishing as well as most places in and around School grounds. 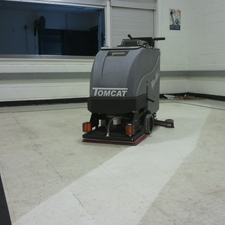 Our Orbital Tomcat EDGE® Technology allows for Chemical Free stripping due to the power of our motors. 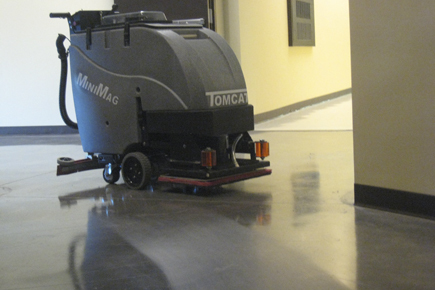 Our Tomcat EDGE® Technology can clean in hospitals with no problems due to low noise generation. 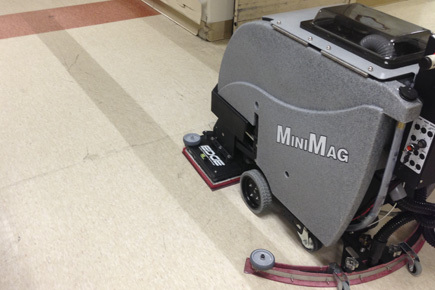 Create stripes of clean white floor when you pass your MINIMAG EDGE Scrubber along the floor! 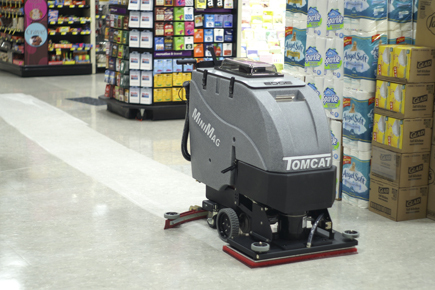 Tomcat's MINIMAG Oscillating Scrubber-Stipper is known for its simple design and durable construction, offering unmatched value for the customer. 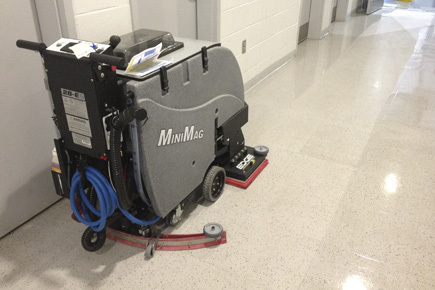 The MINIMAG Automatic Battery Scrubber has a superior sealed Transaxle for climbing steep ramps without the need to push. 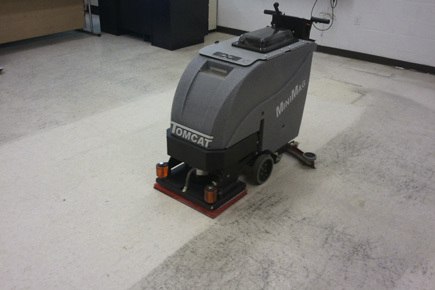 While keeping with the constant durability that Tomcat machines have to offer, your operators will find the Tomcat EDGE® MINIMAG Orbital Scrubber easy to maneuver into tight areas, and simple to service. The deck is protected by steel guards and large polyurethane rollers to keep the unit from marking walls. EDGE® Pad Size: 20" x 14", 28" x 14"
Cleaning Width: 20" & 28"